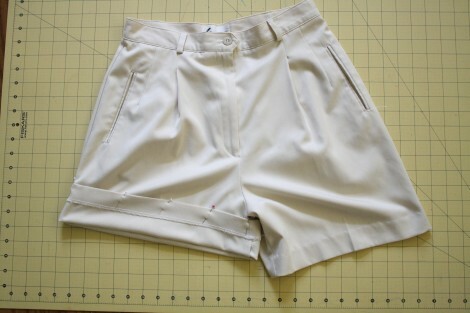 So you ready to learn how to create a scallop hem on any old pair of shorts? Lets do it! 3) Make your scallop stencil. 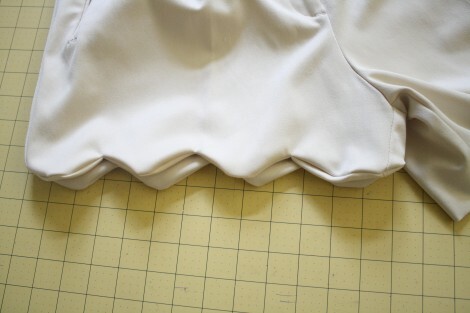 As with my previous scallop hem project, I used contact plastic – that way you can stick it to your fabric, and have an easy guide! 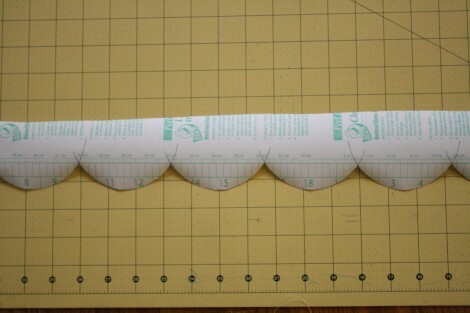 Lay out your contact plastic with the paper side upwards. I used a glass with a 3.5” diameter. 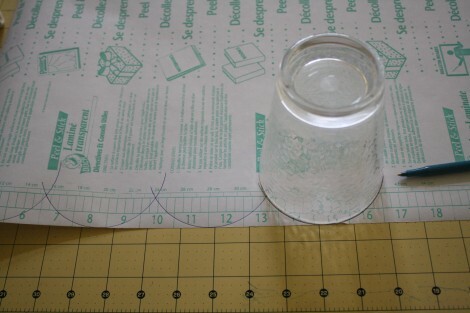 Place your glass so that the edge of the glass lines up with the edge of the paper, and trace half way round. Do this all the way along the edge, overlapping each half circle evenly, and making sure you’re always lined up with the edge of the paper. Last time I chose to make deep scallops by butting up the glass to the edge of each half circle, but this time I wanted them more shallow, so I overlapped them so that they were only 1” high. 4) Cut your stencil out and remove the paper backing. 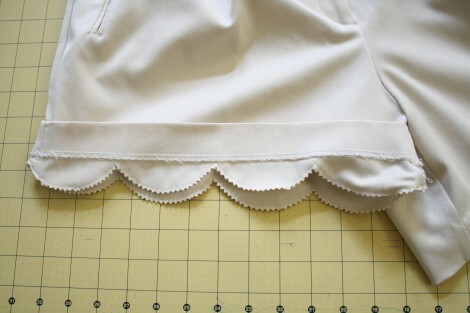 Stick it to your shorts, so that the edge of the scallops is where you would like your finished hem to be. For me this was ½” from the folded edge. 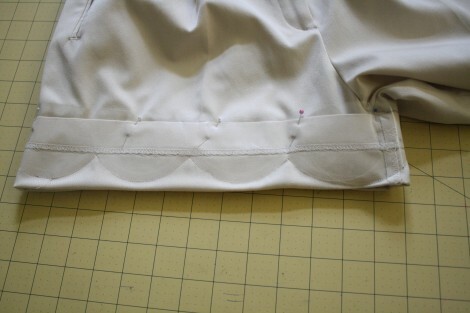 5) Sew around the stencil as close as you can to the edge without actually sewing on it. But if you do, don’t freak out!! It’ll still come off, it just means that you’ll probably rip your stencil a bit and it might not be as re-usable. 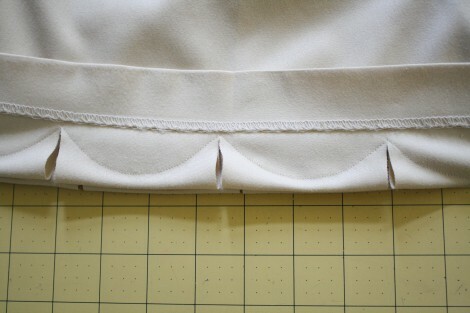 8) Cut inbetween the scallops, as close as you dare to the stitches, without actually cutting them. 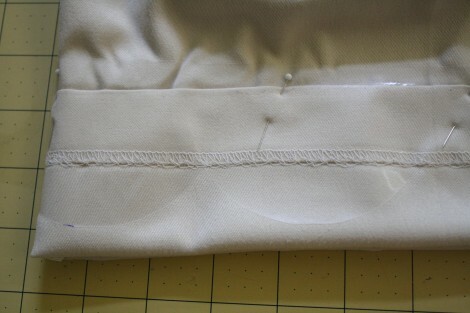 10) Now turn your hem the right way round, so that the right sides of fabric is facing outwards. Using your hand, “push” out the scallops and shape them with your hands. 11) Move over to the iron, and press them nice and crisply. Spend some time doing this properly, because the neater and more evenly you do it, the better your scallops will look. 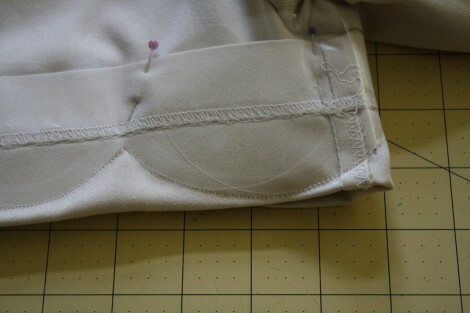 12) Now to finish up that hem on the inside. 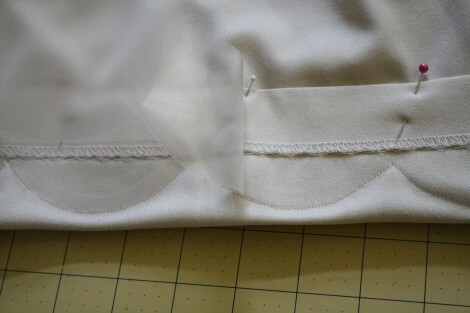 In an ideal world I would not have been feeling lazy, and would have handstitched the hem so that it would be invisible from the outside – but I was tired, so I just topstitched right over the top. It’s not bad, but if I did it again I’d do it by hand. And there you have it! 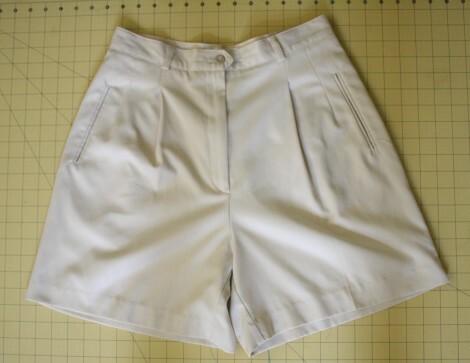 Enjoy your shorts!! This is AWESOME!! And much easier than I would have expected! hehe I know!!! Once I figured out a good trick it was soooo incredibly easy!! I hope you try it too! More scallops! 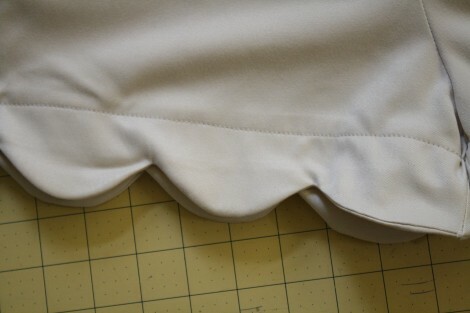 I seem to have been on a scallop binge lately (two scallop-collar shirts, skirt hem finished with scallops and just whipped up a scallop-waistband skirt yesterday evening… Addicted much? ), and think I’ll add this to my list of things to make! ;) I love the contact paper idea for a template–brilliant! i LOVE it. 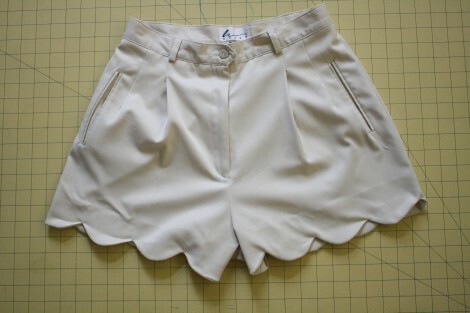 i totally want a skirt like this! Yay!! let me know if you do hun! this is soooo nice!!! Thank you so much for sharing!! it looks GREAT! wow. 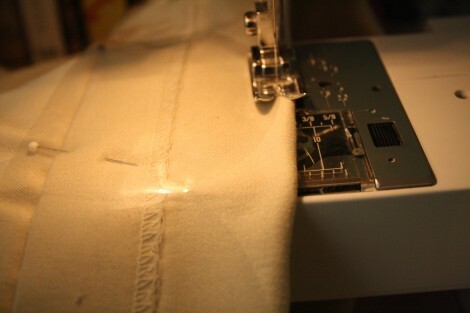 kudos to you for being so creative and managing a sewing machine! Please tell me where you found those clogs! I love them and have been searching everywhere for a low heeled pair. Buttttt I just saw a really really similar pair in Urban Outfitters today for $20. Unfortunately I can’t seem to find a link in their online store (i think it’s because they’re on sale?) – but they did have some in store! You’re going to hate me… but I actually got them in Australia when I was there over Christmas. The brand is called Rubi and you can only get them in store. That’s some clever sewing. Love it. So simply and easy to follow, adding this to my pile of DIY to do list! 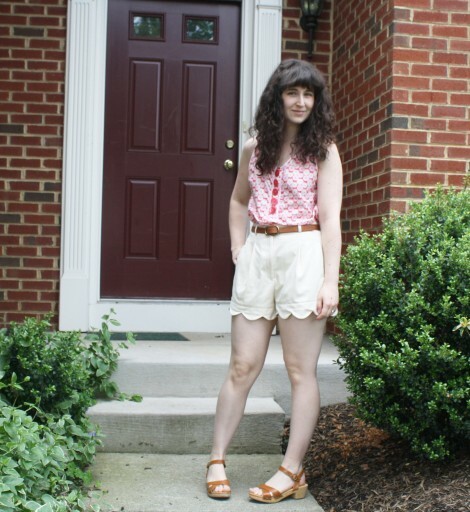 DIY Scalloped Shorts are my new faves « We Were Like Lions. Nice one,what can one use if you dont av a stencil? 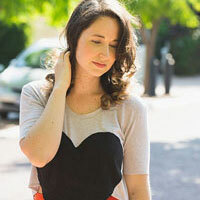 I love this tutorial, and your shorts are so adorable! Also visit my webpage; ?? ?? ?? ???? My homepage :: ?? ???????????? ? ?